GCC Natural Gas Market size was valued over USD 40 billion in 2017 and is set to expand over 4 % by 2024. Shifting regulatory policies toward energy transition and sustainable energy sources driven by concerns over fuel diversification will stimulate the GCC natural gas market size. For instance, the UAE as part of its “Energy Strategy 2050” aims at reducing the carbon footprint of power generation by 70% while increasing the share of clean energy in the net energy mix from 25% to 50% by 2050. Growing need to cater burgeoning domestic demand, achieve self-sufficiency and reinforce energy security will drive the GCC natural gas market share. According to the 2017 BP Energy Outlook, energy consumption across the Gulf region is projected to increase by 54% by 2040, with natural gas representing over 60% of growth. Population growth, improved standards of living, urbanization, and industrialization across the regional economies will further fuel the industry growth. Unconventional natural gas market is set to expand over 9 % by 2024. Increasing focus toward monetization of regional non-conventional reserves to minimize dependency on imports will boost the industry growth. For instance, Oman recently emerged as the first Gulf economy to join the unconventional oil & gas production boom. In 2017, the production began at the Khazzan tight gas field, which is the region’s first large-scale unconventional gas project, worth USD 16 billion. Abundant reserves featuring high-margin and low-cost development opportunities will propel the conventional natural gas market. For instance, the North Field natural-gas condensate field located in the Persian Gulf is the world’s largest gas reserve. According to the International Energy Agency (IEA), the field holds an estimated 1,800 TCF of in-situ gas majorly shared by Iran and Qatar. 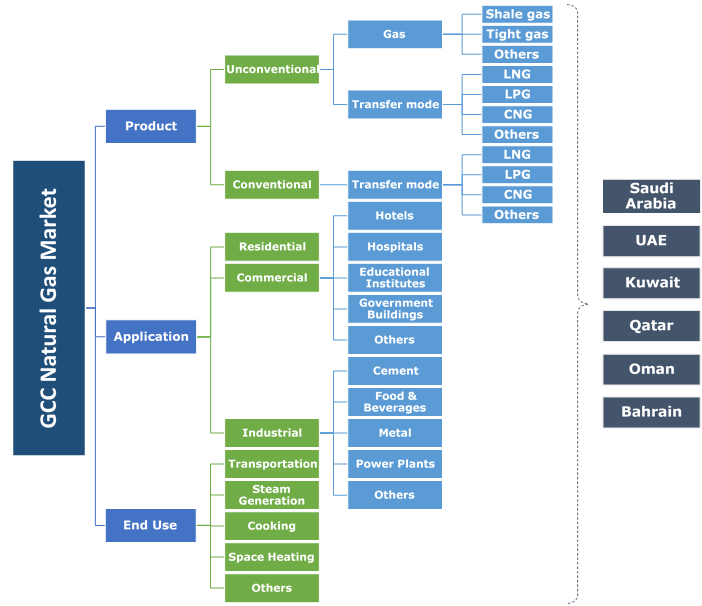 GCC industrial natural gas market, in 2017 witnessed an annual consumption of over 180 million tonnes. Significant advancements in high energy-intensive industries, including power, water desalination, petrochemicals, refining, and fertilizers have necessitated its extensive utilization. Government supported industrialization along with initiatives toward economy diversification will further favour the business outlook. 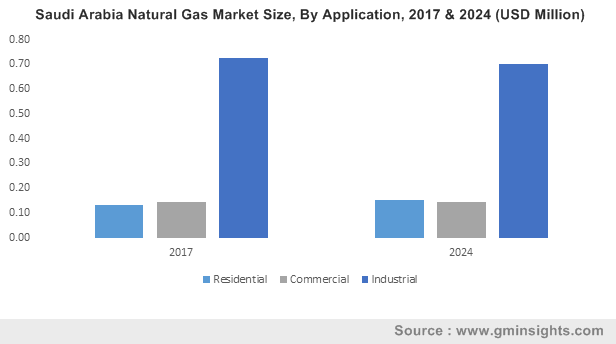 Residential natural gas market will witness growth on account of an expanding population base, rapid urbanization accompanied by a significant rise in energy consumption levels. The demand in the residential sector is significantly driven by cooking and heating applications. Rising environmental concerns over automotive emissions along with ongoing alternative fuel developments will propel the GCC transportation natural gas market growth. At present, the UAE is heading the most notable advancements toward the deployment of Natural Gas Fueled Vehicles (NGVs). Moreover, introduction of government funded ventures to build the complementary NG infrastructure will further support the business expansion in the region. Cooking, in 2017 accounted for over 10 % of the GCC natural gas market share. NG dispensed in a residential establishment can offer temperatures of more than 1,100 °C, making it a viable domestic cooking fuel. Continued low price index represents the most instrumental factor in its rising adoption as an alternative fuel for cooking. Saudi Arabia natural gas market is projected to expand over 3 % by 2024. Growing focus toward unconventional gas production along with a continuous increase in the consumption levels will strengthen the industry growth. For instance, Saudi Aramco, the national oil company announced investment plans of additional USD 7 billion to accelerate the development of shale gas resources to develop the country’s extensive shale gas potential in the coming years. Favourable regulatory policies toward the large-scale monetization of regional reserves will drive the Qatar natural gas market. In 2017, the government of Qatar announced ambitious plans to enhance its LNG production from a current capacity of 77 mtpa to 100 mtpa over the next five-to-seven years. Moreover, the country lifted the self-imposed moratorium on the development of offshore North Field, the world’s largest gas reservoir which will further favor the business outlook. Strengthening E&P activities fueled by legislative fiscal support to minimize dependency on imports will boost the Kuwait natural gas market. For instance, the Government of Kuwait recently announced an investment of USD 500 billion in the country’s oil & gas projects by 2040. As a part of the proposed plan, the country aims at increasing the NG production from 200 million bcf per day to 2.5 billion bcf by 2040.
Notable industry players across the GCC natural gas market include Royal Dutch Shell, Exxon Mobil, GAZPROM, Chevron, Total, ConocoPhillips, Statoil, Occidental Petroleum Corporation, Lukoil, British Petroleum, Petroleum Development Oman, General Electric, Qatar Petroleum, Eni, ONGC Videsh, Rosneft, Bahrain Petroleum Company amongst others. Key industry players are invariably pursuing extended geographical presence, technological innovations and strategic business-led collaborations to attain a dominant market position. In addition, the industry trends are significantly influenced by continued mergers & acquisitions which imply a consolidated nature. Natural Gas (NG) is a hydrocarbon gaseous mixture primarily composed of methane (CH4), and small amounts of ethane and other hydrocarbons. NG finds wide application across residential, commercial and industrial sectors as a clean and economical energy source Ongoing investments by exploration and production companies toward the development of unconventional hydrocarbon reserves will drive the industry growth.